Could a website save the world’s lemurs? 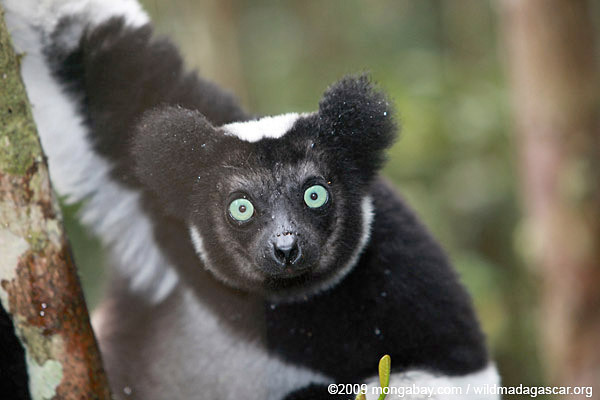 Indri lemur (Indri indri). Photo by: Rhett A. Butler. Last year, scientists released an emergency three-year plan that they argued could, quite literally, save the world’s lemurs from mass extinction. Costing just $7.6 million, the plan focused on setting up better protections and conservation programs in 30 lemur hotspots. However, there was one sticking point: donating to small programs in one of the world’s poorest countries was not exactly user friendly. Enter: Lynne Venart, the head of the design firm the Art Monkey. Venart’s company, partnering with a slew of top conservation groups, is today launching the Lemur Conservation Network. This is where the Lemur Conservation Network comes in. The website allows donors, even lemur-loving individuals who only have a little to give, to finally support lemur conservation effectively and easily. The network brings together over 40 conservation groups and research institutes, which reads like a who’s who of lemur efforts, but it’s target is individual who have a passion for this primate family. The eastern lesser bamboo lemur (Hapalemur griseus) is listed as Vulnerable. Photo by: Rhett A. Butler. Users can select conservation groups by their type of work —i.e. 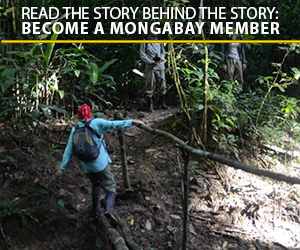 community conservation, research, habitat protection etc. —and, in the future, donors will even be able to look up conservation programs based on specific lemur species. So, if you love the wonderfully-bizarre aye-aye you can put your donation to work for that Vulnerable species. 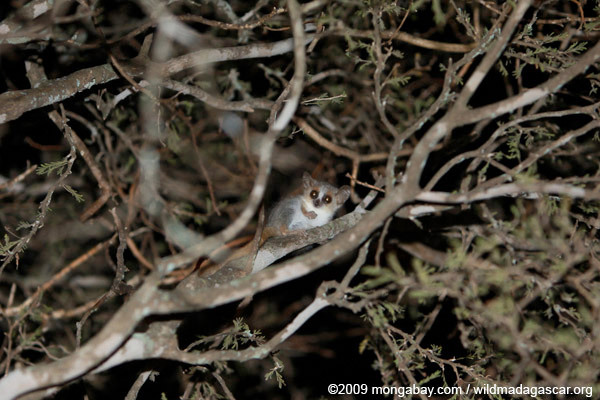 Gray mouse lemur (Microcebus murinus), one of the few species listed as Least Concern. Photo by: Rhett A. Butler. So, why lemurs? Well, for a number of reasons. All of the world’s lemurs are found on a single island and a single country: Madagascar. Isolated from other primate competitors for around 60 million years has allowed lemurs not only to survive here —when they went extinct elsewhere —but to evolve into an astounding variety of types and species, adapted to all sorts of habitats and foods sources. Today, researchers have identified 103 distinct lemur species on the island, a number that has boomed in recent decades due to DNA testing. And more lemur species are likely to be uncovered. 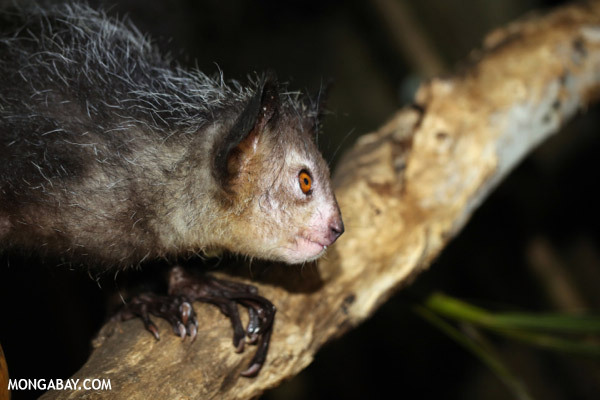 Arguably the world’s most wonderfully weird lemur, the aye-aye. This species is considered Vulnerable. Photo by: Rhett A. Butler. Yet lemurs are one of the world’s most endangered families. The IUCN Red List considers a staggering 91 percent of lemurs threatened with extinction. Of these, 48 are considered Endangered —nearly half —and 22 species are considered Critically Endangered —more than a fifth. The biggest threat to lemurs is deforestation and habitat degradation. Only around 20 percent of Madagascar’s historic forests remain, and these are threatened by slash-and-burn farming, known locally as tavy . The country also remains in the throes of an illegal logging crisis, with loggers cutting rosewoods trees from inside Madagascar’s protected areas and smuggling them to China where rosewood fetches exorbitant prices. While lemurs are the most high profile group on the island, this ongoing forest destruction is imperiling thousands of other species, many of them —like lemurs —found no-where else on the planet. According to the Global Forest Watch, Madagascar lost approximately 1.3 million hectares of tree cover from 2001 through 2012. With an estimated 17 million hectares of forest cover in total —at 30 percent canopy coverage —this represents a total loss of more than seven percent of the county’s forest. It should be noted, however, that this may not represent outright deforestation as tree plantation harvesting may be included in the data. Forest loss shown in pink while intact forest landscapes (IFL) are shown in dark green and forest degradation in brown. Image courtesy of Global Forest Watch. Click to enlarge. On the plus side, deforestation in 2012 was at its lowest point during the whole period, with a total loss of approximately 71,000 hectares. Also, during the same 12-year period, the country also saw regrowth of 407,000 hectares, offsetting some of the total losses. While forest destruction remains the biggest threat to lemurs, a rising issue is hunting, both for bushmeat and even the illegal pet trade. 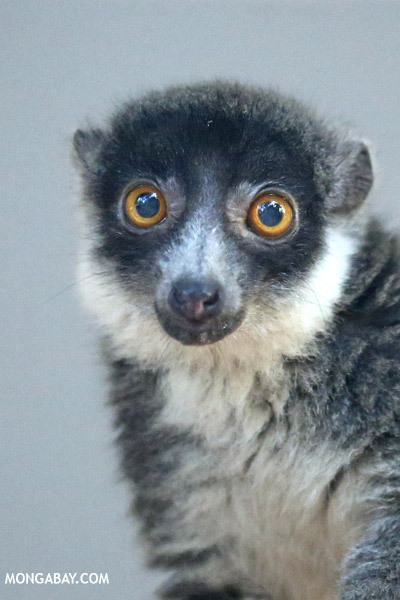 Conservationists say around 28,000 lemurs are taken from the wild annually for either food or the pet trade, putting a number of species under major pressure. Underlying all of this is human population and poverty. 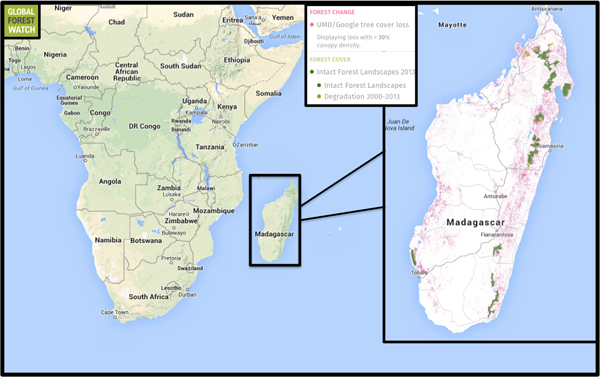 Twenty-one million people call Madagascar home (around the same population density as the U.S.). But, unlike the U.S., the population is booming, growing at nearly 3 percent annually with more than 40 percent of the population under 15. Madagascar is also one of the poorest countries in the world. More than 90 percent of people live on less than $2 a day while half the country’s children under five are said to suffer from malnutrition. Unstable governance, including a coup in 2009, only made thing worse. Yet, conservationists say protecting lemurs could actually help the human population as well. “The work in the lemur action plan does not choose lemurs over people —these organizations are working with the local people to empower them in the fight to save lemurs from extinction and in the fight to save their country’s remaining natural resources,” said Venart. 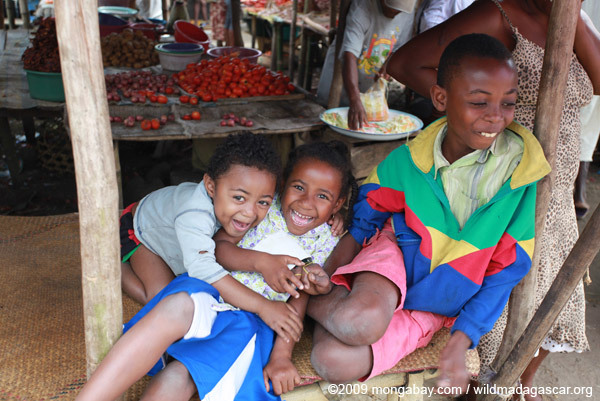 Children in Madagascar. Scientists say that protecting lemurs, and their forests, could build a better future for Malagasy kids. Photo by: Rhett A. Butler. Lemurs are hugely important to the people of Madagascar not just as the best-known symbol of the country, but for the money they bring in. “Lemurs are the goose laying the golden eggs for Madagascar; tourists are not going to come and see empty forests without lemurs,” said local Malagasy primatologist, Jonah Ratsimbazafy, who is the co-vice Chair of the IUCN SSC Primate Specialist Group. Even in the midst of the 2009 coup, when foreign donors pulled out their money from Madagascar, tourists continued to show up to see lemurs albeit in somewhat smaller numbers. A female mongoose lemur (Eulemur mongoz), listed as Vulnerable. Photo by: Rhett A. Butler. 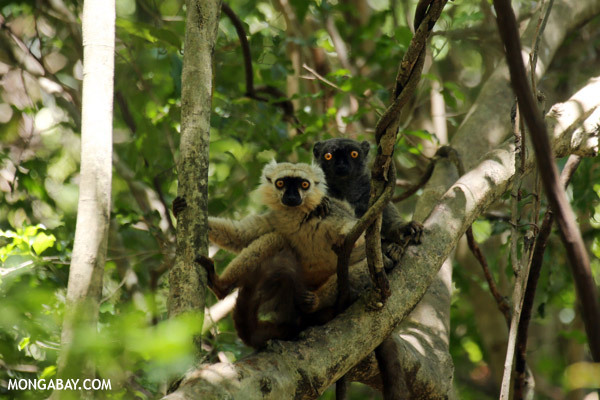 “Thousands of families depend on [lemurs] for their livelihoods,” noted Ratismbazafy. Currently, the country sees around 200,000-300,000 tourists a year, but the new government hopes to push those numbers up significantly. In addition to drawing in visitors, lemurs also play key ecological roles. They are vital seed dispersers and pollinators for Madagascar’s imperiled forests. If the lemurs vanish, so could many plant species and the forest altogether. Forests are vital in the country for erosion protection and water sources. Finally, many of the conservation programs in the country depend on community conservation, making local people stakeholders in safeguarding their wildlife and providing direct benefits to communities. In fact, the new lemur conservation plan focuses on community conservation and the establishment of new community-managed protected areas, which not only safeguard the environment but open up new avenues for tourism. “Lemurs are without a doubt the country’s most distinctive brand in the global arena, and a major asset in scientific, cultural, and economic terms. Their conservation should be a very high priority focus for government and civil society at all levels,” said Russ Mittermeier, Chairman of the IUCN SSC Primate Specialist Group and the Executive Vice-Chair of Conservation International. Pair of Sanford’s brown lemur (Eulemur sanfordi)), which is considered Endangered. Photo by: Rhett A. Butler. The three-year emergency plan —coming in at $7.6 million —is also quite a deal when one considers it could safeguard a wholly unique family of primates. As a comparison, last year, in 2010, donors and governments pledged $300 million to save the tiger from extinction or nearly 40 times what lemur conservationists are asking for. Of course, when it comes to dollars and cents, conservation worldwide is often on the losing end of the spectrum, far outstripped by other issues. This may be one of the reasons why lemurs —despite being known and beloved around the world —remain as threatened as they are. One of the authors of the lemur emergency plan, Christoph Schwitzer with Bristol Zoological Society, said that it’s make or break time for lemurs. Venart added that now is the time to act given that the political situation in Madagascar is finally improving. In December, 2013, the Malagasy people elected Hery Rajaonarimampianin in the first democratic elections since the coup. For his part, Rajaonarimampianina has called for deepening and expanding conservation efforts and pushing ecotourism as a way to raise people out of poverty. “With international aid now returning to Madagascar and increased international business investment interest in the country, there is no better time than now to ensure that these investments benefit the country and the Malagasy people in positive ways by protecting Madagascar’s natural resources and ensuring the survival of lemurs,” said Venart. Indeed, both the fate of the Malagasy people and the lemurs may depend on conservation actions taken today. Close up of deforestation from 2001-2012 in northern Madagascar. Forest loss shown in pink while Intact Forest Landscapes (IFL) shown in dark green and forest degradation in brown. Image courtesy of Global Forest Watch. Click to enlarge. (02/20/2014) Due to the wonderful idiosyncrasies of evolution, there is one country on Earth that houses 20 percent of the world’s primates. More astounding still, every single one of these primates—an entire distinct family in fact—are found no-where else. The country is, of course, Madagascar and the primates in question are, of course, lemurs. But the far-flung island of Madagascar, once a safe haven for wild evolutionary experiments, has become an ecological nightmare. Overpopulation, deep poverty, political instability, slash-and-burn agriculture, illegal logging for lucrative woods, and a booming bushmeat trade has placed 94 percent of the world’s lemurs under threat of extinction, making this the most imperiled mammal group on the planet. But, in order to stem a rapid march toward extinction, conservationists today publicized an emergency three year plan to safeguard 30 important lemur forests in the journal Science. 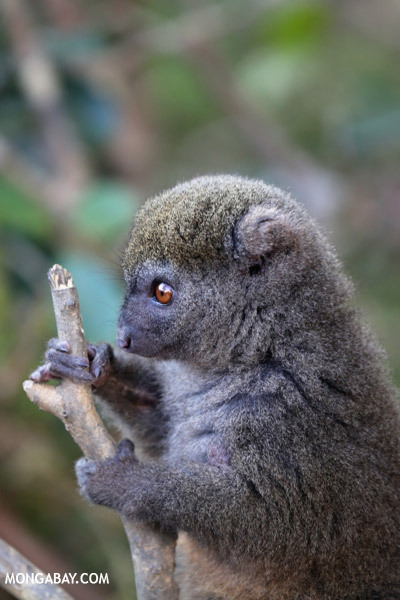 (07/10/2014) Susie McGuire and Dr. Edward Louis Jr. are the powerhouse team behind the Madagascar Biodiversity Partnership (MBP), an NGO that involves local residents—both human and primate—in reforestation efforts in Madagascar. A conservation geneticist and veterinarian by training, Ed Louis has discovered 21 lemur species and successfully reintroduced two species of locally extinct lemurs back into the wild. (06/16/2014) Experts have added 817 species to the threatened categories of the IUCN Red List in the latest update. Those added include 51 mammals—mostly lemurs—and over 400 plants. The new update finds that over 90 percent of lemurs and 79 percent of temperate slipper orchids are threatened with extinction. (05/17/2014) Lemur expert Patricia C. Wright has become the first woman to win the prestigious Indianapolis Prize, an award granted every two years for achievement in wildlife conservation. Wright was chosen for her contributions to wildlife conservation in Madagascar, where she’s worked with lemurs for nearly 30 years. (04/03/2014) Tomorrow’s opening of the IMAX film Island of Lemurs: Madagascar showcases not only endangered primates, but one of Madagascar’s top conservationists: primatologist Patricia C. Wright. (03/20/2014) One of the world’s biggest populations of greater bamboo lemurs (Prolemur simus)—sometimes known as the panda lemur—has doubled in just three years, giving conservationists new hope that the species can be kept from extinction. With the recent arrival of twenty babies, a community conservation project run by the Aspinall Foundation has boosted the local population to over 100 individuals in Andriantantely, one of Madagascar’s only surviving lowland rainforests. Greater bamboo lemurs are currently categorized as Critically Endangered, though they were once believed extinct until hidden populations were uncovered in the 1980s. (12/18/2013) The ring-tailed lemur (Lemur catta), perhaps the most well-known of Madagascar’s endemic animals, is facing a “very high” risk of extinction in the wild. The Madagascar Section of the IUCN Primate Specialist Group reassessed the Red List status of ring-tailed lemurs and upgraded the species from Near-Threatened (2008) to Endangered (2012). Ring-tailed lemurs are facing extinction in some parts of Madagascar because of continued habitat loss, and more recently, species exploitation. (12/05/2013) After playing, feeding, and socializing in trees all day, some ring-tailed lemurs (Lemur catta) take their nightly respite in caves, according to a new study in Madagascar Conservation and Development. The findings are important because this is the first time scientists have ever recorded primates regularly using caves (see video below). (08/21/2013) Raising young lemurs in communal crèches benefits both mothers and offspring, a new study has found. Andrea Baden and colleagues, of Yale University, studied a group of black-and-white ruffed lemurs (Varecia variegata) in Ranomafana National Park, Madagascar. This is the first study to examine the consequences of different parenting strategies in the ruffed lemur. (08/14/2013) Primatologists and researchers have devised a wide-ranging plan to protect Madagascar’s most endangered lemurs from extinction.